What is Ultra Premium™ (UP) ? In today’s environment of widely available olive oils of varying grades and false claims of being “premium” or “gourmet” it was necessary to create a new designation to assure consumers of an oil’s freshness, true quality, and authenticity. The Ultra Premium™ standard was developed by Veronica Foods, Olive Oil Emporium’s exclusive supplier for all Olive Oils and Vinegars, to identify the finest and freshest Extra Virgin Olive Oils in the world. The Ultra Premium™ standard has as its principal barometers Chemistry and Freshness. These two underappreciated variables can be objectively measured, quantified, and certified. The meaningless “best by” date being printed on many bottles is only meant to accommodate the retailer and bottler, and to mislead the consumer. 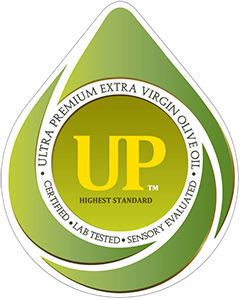 The three pillars of the UP standard require that UP oils are Certified, Lab Tested, and Sensory Evaluated. All oils bearing the UP seal must adhere to higher than current industry certification standards, must have met the established chemical requirements and verified by an accredited third party laboratory, and must have also been evaluated by an independent, objective, third party sensory panel. To learn more about the UP standard please visit the official website for Ultra Premium Extra Virgin Olive Oil: Highest Standard for Quality Olive Oils. A complete description for each of the UP criteria is available at the official UP Olive Oil site by clicking on each of the following links: Production Requirements, Storage Requirements, Testing and Compliance, Chemistry, and Organoleptic Criteria. 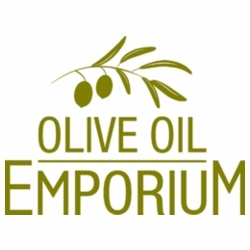 The Olive Oil Emporium Artisan Oil and Vinegar Tasting Bar is Toronto's ONLY supplier of true certified Ultra Premium™ (UP) extra virgin olive oils. Many other olive oil retailers may claim to offer “premium oils”, but this is simply an attempt to manipulate and confuse the buyer. Without the official UP logo and certification to accompany their olive oils, the claims are simply unsubstantiated. For our complete selection of Ultra Premium™ certified Extra Virgin Olive Oils from all around the world please click here: Ultra Premium Extra Virgin Olive Oils. Click here for directions, hours, and address details.